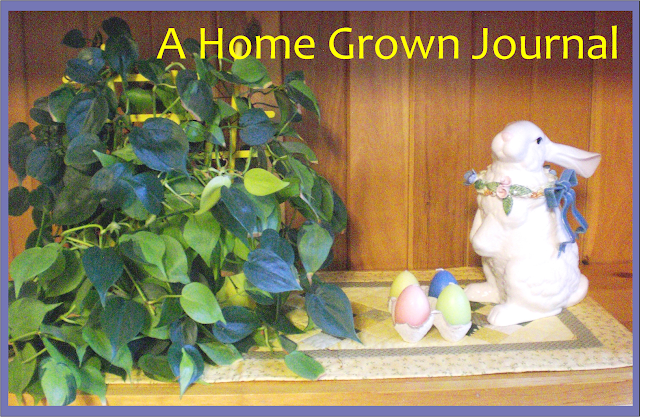 A Home Grown Journal: Let's Have A Giveaway! 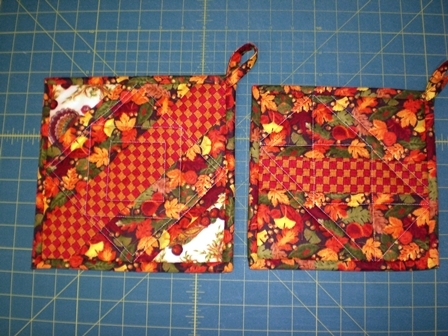 I made a couple of autumnal/Thanksgiving themed potholders that I'm offering as a giveaway here on my blog. Are your present potholders so dilapidated you'll be embarrassed to let your guests see them at Thanksgiving time? 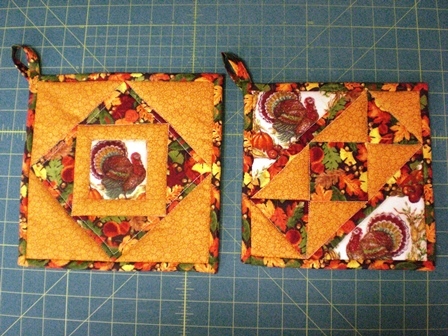 Or have you been invited out for Thanksgiving Dinner and would like to take these as a small hostess gift? The front of the potholders. The potholders are washable and dryable when needed. This is Tuesday, the 6th of the month. If you wish to have your name put in the hat for a chance to win these, please let me know in the comments section before Friday, the 9th, at 9 p.m. when my computer will be shut down for the night. I'll draw a winner Saturday morning and post your name. Even if you've never commented on my blog before (or comment regularly -- thank you! ), feel free to enter your name for the drawing. Anybody interested?? I'm interested! And I thank you for a pleasant diversion and breath of human kindness on this election day. Hugs! Very nice! Thank you for the opportunity. I would love to have a chance to win the lovely pot holders. I can gift to my son’s family. There are to good for my shabby place. Kathy - You're welcome, too! DDD - Don't be silly! They would be fine in your home, I know. They are is cute, my granddaughter who is now in her first home by her self would love them. I knit but do not quilt. Hope you are all OK up there in the Frozen North! We are getting some cold weather now also. Myrna - How sweet of you to think of your granddaughter and her first home! We're having warm weather (too warm for those of us who love winter and snow). Temps in the 40s, lots of grayness and rain, rain, rain. Well, saves on shoveling and plowing right now, I guess! These are beautiful, I’d love to be included. Count me in, those pot holders are lovely! Ruth - You are included! CWfromIowa - I know what you mean about the smallest of gifts meaning so very much. And the fact that you've had those gifted potholders all these years. What a wonderfully good memory. Tired Hobby Farmer - Thank you, THF! Beautiful potholders! I should leave my name out of the drawing, though, because my husband would either burn one or permanently stain them both in no time at all. He loves to cook, but everything he uses to cook with has some sort of permanent reminder that he's been in the kitchen. Charade - You said you "should" leave your name out of the drawing . . . but just because they will get used (that's what they are intended for!) is no reason to not take a chance on winning them. Shall I put your name in for the drawing?? Come on, live dangerously! I would love to have a chance to win those lovelies! Thank you! Sorry about the Anonymous. I’m old and don’t know how to do it differently! Hello and yes please Mama Pea please put my name in the pot! Would love to win the beautiful potholders! Thank you so much for offering them! I'm hosting Thanksgiving here this year, so I would gift myself, lol. Would love them. These potholders are lovely. I would love to win them! I'm definitely in. What lovely potholders! Anon (Barbara W), Lisa French, wyomingheart, kt, Kristina, Janet Smith and Theresa Young - All your names are in the hat for the drawing. Thanks to you all for participating! Of course I'd love to be entered in this delightful Giveaway!!! Thank you for offering. I'd love a chance on the pot holders, their lovely. I thank you very much . What fun!! One can never have enough (of your) potholders! Love the fabrics! Rain - Many more names in the hat than I ever expected! Chicken Mama - As the names come in, I cringe thinking, "But there can be only one winner!" And feel bad about that. :o( I have no more Thanksgiving-themed made, but I think I do have a couple Christmas ones . . .
Mama Pea, they are gorgeous! I already have some of your potholder (highly treasured!) so I almost feel guilty saying I'm interested in these. But I am! It's no wonder Mama Pea, that is a really cool giveaway! I can't expect to win again but my fingers are crossed!! I've not posted on your blog before but am a faithful reader. I would love the opportunity to win this set of potholders. Unfortunately I lost all of my home made potholders to a house fire the beginning of the year. I am working to replace everything. Thank you for a lovely and informative blog. Valerie Dibble - Oh, Valerie, I am so sorry to hear of the devastation you must have faced with your house fire. Such a loss to go through. And thank you for being a reader of my blog, for commenting here and saying such nice things. Your name is in the hat! Goatldi - Your name is in the hat. Any quick update you can give on your husband? Been thinking about you both . . .
Will email you at a later time. We are persevering. Very difficult times. These are absolutely beautiful! I wish I was talented to be able to make such beautiful things. They are beautiful; please enter my chance to win. The Autumn season is my favorite time of year. They are so pretty and you did a wonderful job. Would be blessed to win them.